The iConnect allows universal ear level fm receivers (eg Roger X or MLxi) to be connected directly to Advanced Bionics Auria & Harmony processors. Available in 3 colours to match the processor body - please select above. Please note, neither the radio receiver nor the implant processor are included with the iConnect earhook. The receiver must be purchased separately (see below). Please note for hygiene reasons this product is excluded from the Connevans extended returns policy. 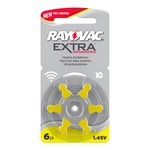 Pack of six YELLOW 10 size 10AUX-6XE - Rayovac Extra Premium Pack Zinc Air hearing aid batteries. 0%Hg - mercury free. Clarion to fmGenie and Sennheiser Microport 2013 radio aid lead.